Welcome to Greenville Wrecker! We manage all of your light and heavy towing needs and we are crazy about towing Greenville! You expect your vehicle to get you where you need to go. Whether it's a thrill ride through the mountains, a fast grocery store run, or your everyday commute to work, it is easy to take your automobile for granted. Having car trouble is terrible and can definitely put a "cramp in your style". We understand how much you depend on your vehicle because we are tow truck experts. That is why we are anxiously waiting for your call for towing services near the Greenville, SC Area. We'll be there fast and come to your rescue with affordable towing services at your request! Whether your transmission went out, you have a blowout and don't have an extra in your trunk, or your vehicle is not drivable because you were in an insane crash, Greenville Wrecker is here to help. We will reach your location as quick as possible, get your vehicle positioned on our tow truck, and transport it to the service center you select, so you can get your car running again as soon as possible. We'll even drop you off at any place you would like us to! We'll show anyone why we love towing Greenville! Get in touch with us now for all of your towing and wrecker service needs! Call us today at 864-249-1249! ​Are You Looking For The Best Towing Company in Greenville, SC? As soon as you contact Greenville Wrecker; one of our helpful dispatchers will jump to it and find the nearest tow truck near you, so you don't have to spend anymore time stuck on the side of the roadway. We know that any circumstance involving a broken down vehicle is frustrating and stressful, and our team wants to help and try make to it a little less painful with our speedy and trustworthy tow truck service. Whatever car you may be in, our skilled tow truck drivers in Greenville are well equipped to handle the situation. They will safely and securely deliver your vehicle wherever you need, and you can be sure that it will be in the same condition as when it was picked up. Because we will take care of everything, Greenville Wrecker is here to help during your crisis so you can stay calm and not worry. In the unfortunate occasion that you are having car troubles, call the best tow truck service in Greenville, SC and soothe your troubled mind. Located in the city of Greenville, SC, our reputable tow truck company has come to the rescue of many stranded drivers over the years. From our experienced tow truck drivers to our helpful and friendly dispatchers, we are recognized for our excellent customer service and ability to solve any towing and recovery problem. Nobody wants to have to call a towing service or wrecker service, but if you ever do, you'll want to connect to the very best. You don't need to go far to find the best towing Greenville has to offer! Greenville Wrecker has a sizable fleet of tow trucks standing by to help you during a difficult situation. Whether you find yourself in a hard to maneuver parking lot, out in the country on a rural road, or stranded on the side of a busy freeway, we'll get there promptly and have you and your vehicle where you need to be as soon as possible. Never settle for just any old tow truck company- call the very best tow truck service and wrecker service in the Upstate area. At Greenville Wrecker, we are ready to tackle any of your towing needs and are equipped with a wide variety of towing and recovery vehicles and equipment. We are well known for our helpful and friendly personnel, ability to deal with stressful situations, fast response times, and our cheap towing service prices. When you use Greenville Wrecker once, you'll never want to use another tow truck company in Greenville, South Carolina ever again! Contact us and let us show you the reason that we are considered to be the best local towing service and wrecker service in the business and the best towing Greenville has to offer! You understand the feelings of aggravation, anger, and anxiety all too well, particularly if you've ever had to deal with your car breaking down while you're trying to get to your destination. How am I going to get home? This car isn't that old- what the heck is wrong with it? These kind of questions run through your mind in those few minutes after you realize your car isn't going to fix itself, and you're stranded. At Greenville Wrecker, we would like to calm your nerves, alleviate your anxiety, put a smile on your face, and get you back out on the road as fast as possible. Our team of dispatchers and tow truck drivers are some of the most experienced and knowledgeable in the business. Whenever you need a tow truck service or wrecker service, call us, our dispatchers can evaluate the situation remotely and figure out which type of tow truck and equipment will be needed to get the job done for you. One of our professional and friendly tow truck drivers will arrive on the scene and have your car ready to go, within minutes, to the nearest service center in no time flat. Our tow truck drivers have a reputation for their commitment, backbreaking work and towing expertise and will be able to deal with any towing job that comes their way. Do not panic! Just call Greenville Wrecker and we'll take care of the rest, even if your car breaks down in the middle of rush hour traffic! Are you still looking for the most reliable towing Greenville has to offer? Our staff keep saying Greenville Wrecker is the very best tow truck company and wrecker service in the region, but how do we know this? It's not just because our mothers told us so. Besides quick response times, availability of equipment, our pleasant staff and the capability to efficiently handle any situation, you'll discover that we have some of the lowest tow rates in the business, making them budget-friendly to almost anyone! We understand that you are already stressed over the costs of getting your vehicle repaired and don't want to add to the tension. While most cheap towing services in Greenville are just that, low and cheap quality, we don't compromise the quality of service you receive due to the fact that our prices are low. Combining quick response times, low cost towing, premium service, 24-hour support, and a crew of passionate and dedicated professionals, we are devoted to surpassing your expectations of a quality towing services every day and every time. We are a towing company with the ability to pull almost any kind of vehicle, such as trailers, cars, motorcycles, and trucks. Our heavy towing vehicles are perfect for semi wrecker service and RV towing services. Anyone can depend on Greenville Wrecker to provide fast service so you can get back on the road! 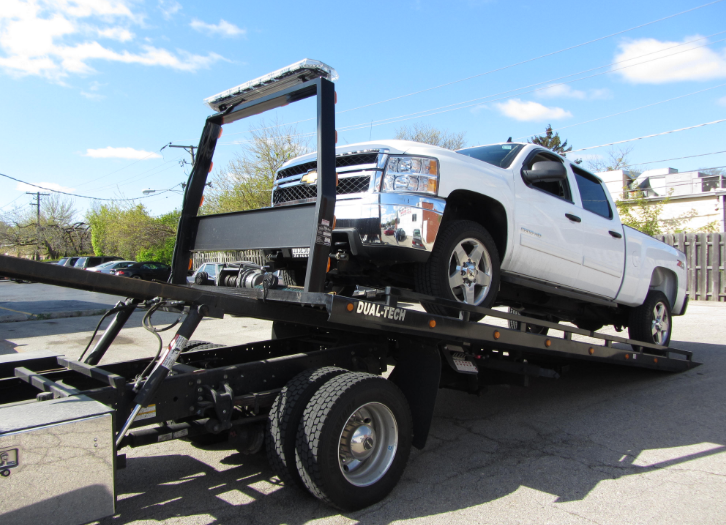 Our flatbed towing service will do the job if you are involved in a car accident or you can't place your car in neutral gear. We are ready to work hard, get grimy and make your life a little simpler during a difficult time. Contact Greenville Wrecker if you are trying to find an affordable, reliable, and hardworking tow truck service near you. We love towing Greenville, South Carolina! ​Car accidents happen and vehicles break down, sometimes in the middle of the night. Greenville Wrecker is here when you need us the most, whenever that may be. We are on call 24-hours a day, 7 days a week, 365 days a year for any of your towing or wrecker service needs. Ending up stuck on the side of the road in the middle of the night can be a frightening experience. Understand that our team will get there quickly, and our emergency towing service will come to the rescue so you can get off the road and to your destination. When you're faced with a flat tire, dead battery, or transmission failure, we're your guardian angels on the way. We provide emergency roadside assistance to the Greenville, SC region when one of our fellow community members is in a difficult situation. Our experienced and knowledgeable tow truck drivers have practically seen it all and can help you with just about any problem you may encounter. Whether you need towing and recovery, a jumpstart, flat tire change, or gas delivery, we are on call 24-hours a day to help you. You will never want to use another towing service or wrecker service again once you use Greenville Wrecker to help with a car problem. You won't believe how promptly we will reply to your phone call, hook up your car or truck to our tow truck, and get you to your destination. When you are confronted with an emergency situation, patience is thrown out the window, and that's where we come in. We do not want you to wait a second longer than you need to wait to get help in a nerve-racking situation. Call Greenville Wrecker for 24-hour towing services any day of the week. Not only is Greenville Wrecker quick to respond to your vehicle's problem, but we are professional and friendly, able to manage tricky situations, and very cost friendly. We will bend over backward so you'll have total satisfaction and you'll want to be a client for life. Having to call a tow truck provider is certainly never fun, but we will try our hardest to make the experience pleasant for you! Call us now! You'll see how much we love towing Greenville! Call us now at 864-249-1249!